I don't really like shoes from Office. Often the concept is good but the execution is not so clever. Also, their sale prices aren't particularly attractive either. They're like Barratts, might knock off 20% at the end of a line, but nothing that makes you want to spend money like some of the other [better] brands. Consequently, I don't visit their website. Means I missed out on a real bargain. It's been some time since I've missed out on something I liked, but I really did miss an attractive bargain with this one. Thought I'd double check the Office web site .... Found them, but only size 3, 4, and 5 left in stock. The worst of it was, their sale price. Down from £165 to £40. And no size 8's left!! Just had a look 12.44pm. Back to 3, 4, 5. If you see a size 8 again, buy them, and I'll sort out the money with you later. I realize my response is a little late, but that is a great looking boot. Must be nice to have a reasonable shoe size. I don't usually do long boots, and never thigh boots, on account of my svelt [skinny] legs. My calves have a circumference of something like 13 inches. Almost any boot made, looks like a wellington boot on my legs. Those Office boots had quite a small calf on them, which was the reason for my interest. Spotted some thigh boots in PU with 5" heels on an auction site, made by a company called Sexyca. I'd tried on a pair of their knee boots some years ago in Northampton, and a UK8 was a perfect fit. Shame they weren't a better fit so you could have kept them. You may have to get custom made ones. I'm not 'mad keen' on thigh/OTK boots anyway, though I did own some from Priceless Shoes, I didn't like taking off. They were made from a neoprene type material, and fitted like a glove. Sadly, the construction quality of the rest of the boot wasn't up to much. Okay for looking, not so good for wearing. Hey-ho. The last time I went into a Office store they only stock heels up to a size 8. Had a look on their web site last night and seems to be now selling size 9. Have they now started selling size 9 in stores as well now? I think their shoes are pricey . I've yet to buy and keep a pair from Office. I recently bought a pair of their On Top courts in black patent, but returned them. I have a similar pair already, but wanted to check for size. They fitted very well. On the face of it, £65 does seem like 'expensive' except ...... There is nothing I know of that comes close in heel height (almost 5 inches) and is leather rather than plastic. The nearest next thing I know of to the Jaguar, was Zara with a very similar style in leather, at £70. That was also a style I found too late, with none available either on-line nor in the 8 stores I've looked in. Next up is the Carvela suede or pastel parent court with high/slim heel at £100 to £120. Kurt Geiger suede version at £190. Higher priced still, the original Jimmy Choo Anouk that all the other styles mentioned have copied, selling at around £500. When alternatives are grouped together like this, with £65 being the lowest price for a stunning looking shoe, can they be said to be expensive? Especially when the sellers (Office and Zara) sell all their stock VERY quickly. It suggests most buyers would consider the price a "bargain"? Office found 10 pairs of the black leather On Top shoe size 8, they released to an auction site. I bought a pair. Saved a little money, though they sold them at a Buy It Now price. Very pleased with my purchase, though I've no idea where I'll wear them. Haven't yet done a photo of them, but here is a photo from their web site. Lovely skinny high stiletto heel! 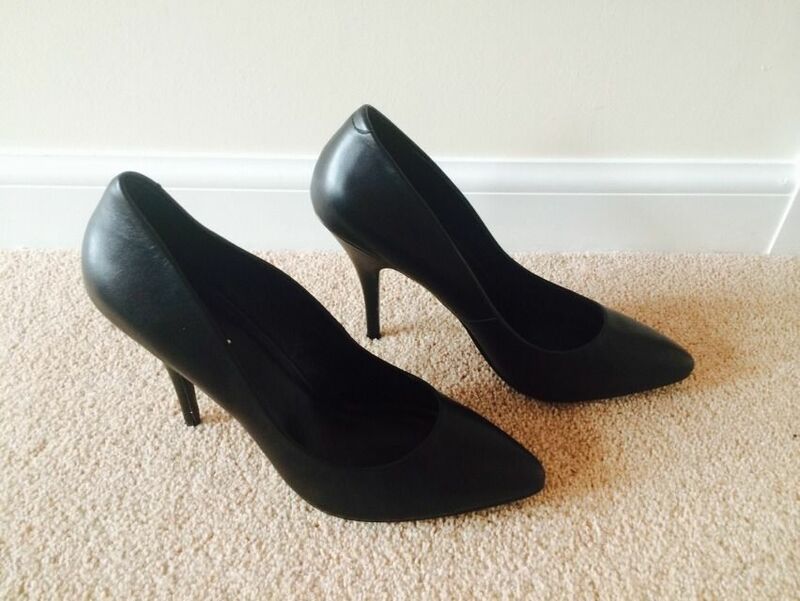 I've been trying to buy a replacement plain black court shoe for some time. As usual, these will be too nice to wear out. Your perseverance paid off. Well done. Great looking pair of shoes. To be honest, getting THAT particular shoe was a bit of luck really. 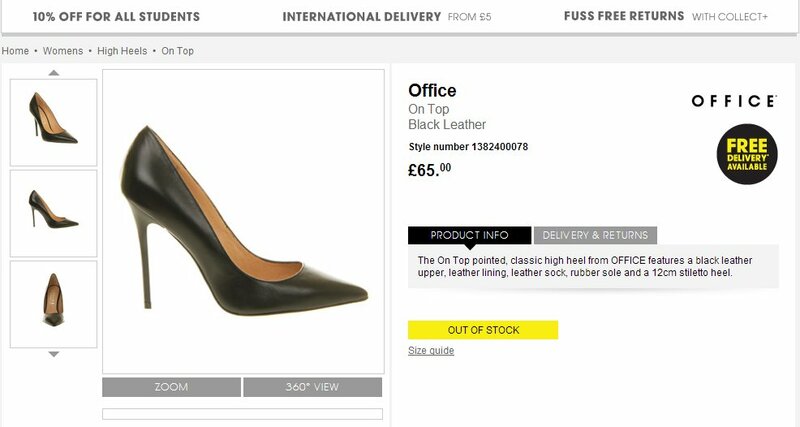 Doing a search for "Office Shoes" even using the 'brand' only criteria brings up every listing with the word "office" in it. So usually I don't bother. This time I must have stumbled across a style that was in the Office Shoes store on the site, so I just looked at every style in the heels section. The ones I wanted were there! I ordered them up and they arrived in perfect condition and good fit. Another pair for the collection. They look good.. Good find. Been after a leather court shoe for some time now and just bought a pair. I have other court shoes in patent leather and satin but not leather . These fit well and the heel is 5"
Where from? The picture has a dollar name .... Are these imported? I didn't mention the make on purpose . They are from Pleaser. Bought them on Ebay last week. Wore them last night and the fit is good. I missed the end of the auction, but I would not have bid that high anyway. A 4½ inch heel maybe, but not 4. Office as a brand has changed significantly since I first authored this thread. It would seem someone into heels, has joined their buying team. Quite a lively auction, with 28 bids! If those boots had been shown in all their glory, the seller might have seen over £100 on that auction. The picture did his sale no favours at all. They did look a little dead. As you say, a more enticing photo would have brought out bigger bidders. They are probably quite nice boots. you guys are right, many sellers fail to "market" their boots properly online. Showing boots laying on the ground really misses the mark, nice boots like that should be properly modeled for maximum bidding prices. "Essex" biker boot from Office, AW2010 originally at £160. Readers and members will have to be aware, putting specific references in the right place (due to the meanderings of the human thought process), is proving something of a challenge at the moment. This thread started as Office thighs, so I will continue with it as I have some pertinent info (and pictures) to add. As with the Zara thigh/OTK boots, (another potentially linked thread) finding a suitable size 8 proved to be a challenge, after the boot was found to be a candidate for my skinny legs. I had been 'checking out' the court shoes in an Office concession in London over last weekend, and caught sight of a boot I had referenced in the thread "AW2015"; the Office "Eve" boot at £120. While I had identified it amongst other styles, I had not expected the legs to be as stretchy as they were 'in the flesh', nor as slim. Once discovered, the hunt was on. Back at home, there were no 8's available online to be had (again). I know an Office 8 comes up small compared to many other brands, but an Office 8 court, is a better fit than a larger size simply because an Office 9 would just fall off my foot. While an Office 7 shoe would not fit, chances are I could get my foot into a size 7 boot, well enough to establish whether the shafts were anything close to tight. (Boot sizes are supposed to be slightly larger than shoe sizes ~ as shoes are often worn using naked feet, boots often worn with socks.) So I ordered up a 7, which was available. Some of the 'impetus' of immediate ordering, was the 20% discount over the weekend. It has continued online, but stopped in store. (Which is odd.) So a UK 7 in PU was ordered late on Sunday night. If I found the shaft on the 7 was reasonably tight, I might catch a pair of 8's as 'returns', or faulty (worn in store) or keep a watchful eye on auction sites. I would at least know of a style that fitted.... Hope burns eternal?